Wow seems like ages since I posted, although Easter wasn't that far away but I have been keeping busy and trying to stay off the web a bit. I needed to do some necessary things and now I decided it is time to give the house a bit of a clean out and that is going to be an undertaking in itself. I have managed to sneak some play and creative time in here and there . I am also into watching Playoff hockey. My Toronto Maple Leafs didn't make it again this year, we won't go into that but now I am watching the other teams battle it out and there have been some battles. The little tag, is flipped up at the bottom then some kind of felt or stuffing in the crease to insert the stick pins. The pins are lovely and I can't wait to use them. 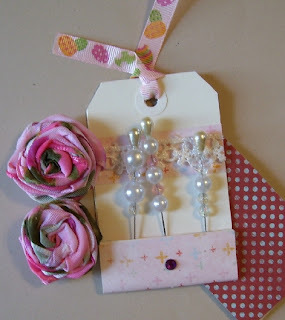 The dotted paper is a nice note she sent along with it and these beautiful roses made of rolled fabric. Tee thanks so much, I was so surprised to receive it. Then a day or so after Tee's arrived I get a small box from Amy Jo over at her blog Art from the Heart. 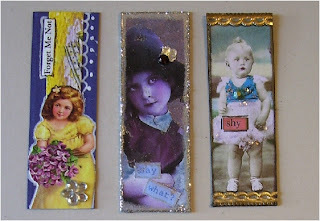 Next are 1x3 cards I received in last months Tabby swaps Vintage Children swap. These came last week as well and I was thrilled. 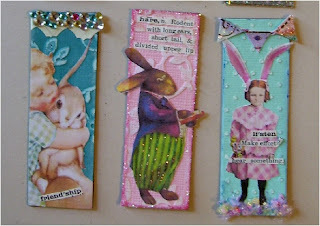 I have never traded 1x3's before doing the Tabby swap and they are so much fun and such a small canvas to work with, but these are truly fun pieces. 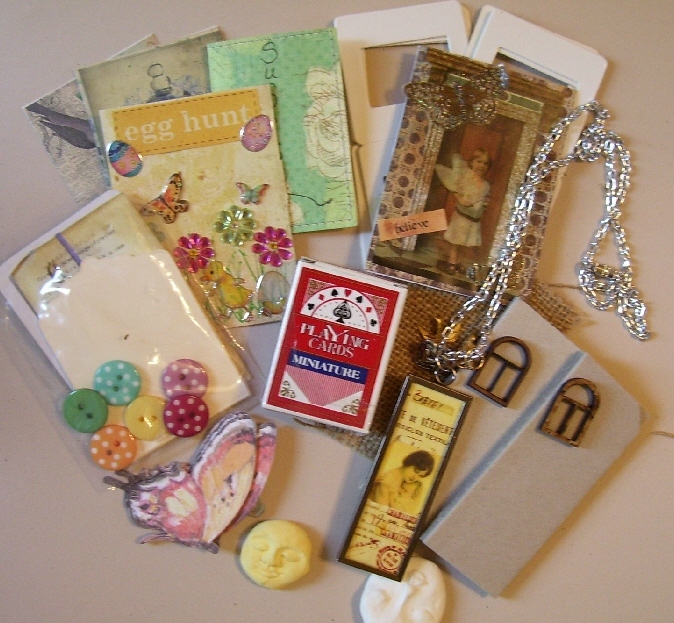 Thanks to Kim for running such a great swap and the ladies that made these. You made 6 and got 6 in return...how fun is that??? The 6 1x3's below are for this months swap...Some Bunny Loves you over at Tabby swaps and I made sure there was a bunny or bunny ears involved....I had a lot of fun with these....I got my Cuttle bug out and some Co-ordination papers and sanded the embossing on some, I used glitters, gems, sparkly borders and I even used some home made Flower soft. 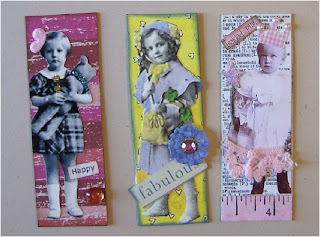 I got a lot of my images either from FlickR, Graphics Fairy and other places around the net. And last but not least is another Tea card I made using a line of paper from Bo Bunny. When I saw this paper I knew immediately what I was going to do with it and if you read my post about Tea cards you will find a link with full tutorial over at Shawn's blog. 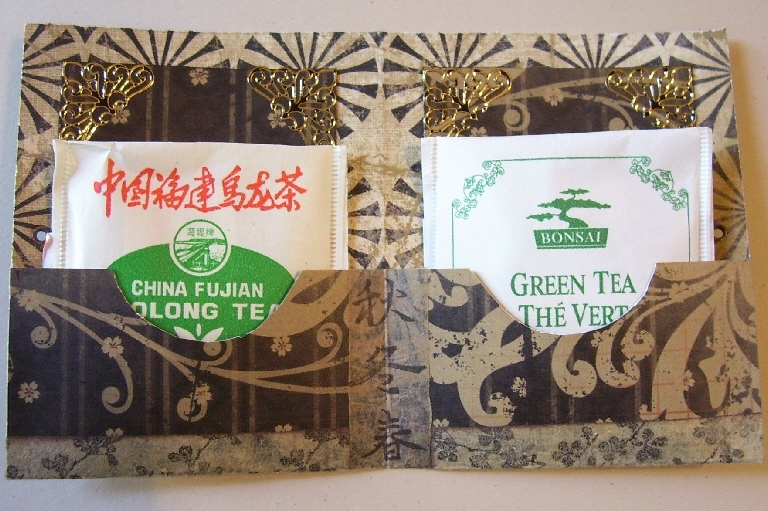 I plan on sending this to someone soon, I think they might enjoy a cup of Green or Oolong Tea. ﻿Well thanks for dropping by. I can't wait to show you some mini canvas boards I was working on as well. 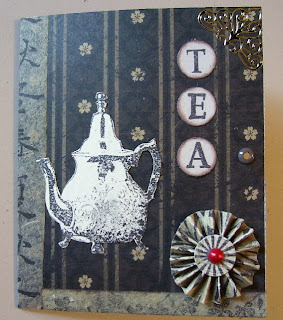 I'm so happy to see my little tickled pink card has gone to such a good home! Aren't Kim's mini card swaps fun? Love your bunnies Les. I couldn't resist joining in on that one too. Lucky you to get the RAKS, you so deserve them too. 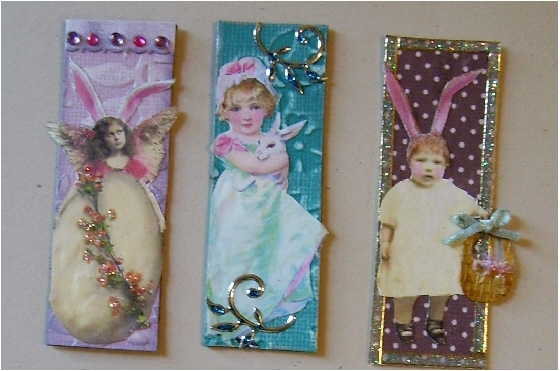 Beautiful 1 x 3 cards sent & received! Very Nice!